Spark is delighted to announce that two of its projects; Starhill Gallery in Kuala Lumpur and Fai-Fah in Bangkok have won the 2013 German Design Council awards for “iconic” projects, in the Architecture categories of Best Retail Project and Best Public Project. The awards will be presented at a ceremony to be held in Munich this October. Fai-Fah, which means “light energy”, is a corporate social responsibility (CSR) programme initiated in April 2010 by TMB Bank. The programme acts as a catalyst for change in Thai society through working with underprivileged children and teenagers in their community using the arts as a vehicle for self-development and creative thinking. 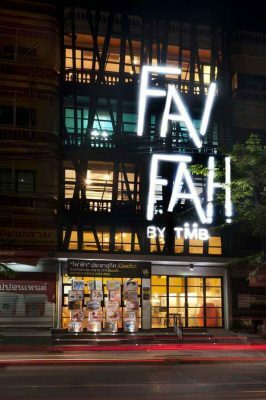 In October 2010, Spark was invited to design Fai-Fah Prachautis, the refurbishment of two shop houses located in a residential district of Bangkok. The art and creative education programmes contained in the client’s brief have been distributed over five floors, and include: the multi-function “living room”, the art studio, a library, the gallery, the dance studio and a multi-purpose rooftop garden. The design was developed at interactive workshops with the Fai-Fah children and teenagers, volunteer arts staff, and members of TMB’s CSR team. Ideas generated during the workshop such as the façade screen and the interior colours were incorporated into the design, underlining the positive nature of the collaborative process and ownership of the concept amongst all of the project’s protagonists. The five levels of the building are linked by a central feature staircase with each level defined by its own colour theme. Utilities and services are housed in a new inverted Lshaped structure, the “Utility Stick”, which is plugged into the rear of the building; it rises from the courtyard and bends to form a garden store at roof level. The existing shop house façade has been transformed by the application of a bespoke lattice screen and Fai-Fah logo, a statement that the building is different from its adjacent neighbours and announcing to the community that Fai-Fah has arrived.